Urban Oasis was selected as the winning idea for a series of large scale sculptures at Surfers Paradise, City of Gold Coast, Queensland Australia. I was very excited to have been awarded this project! Montage view of work in context. Alex Pentek. 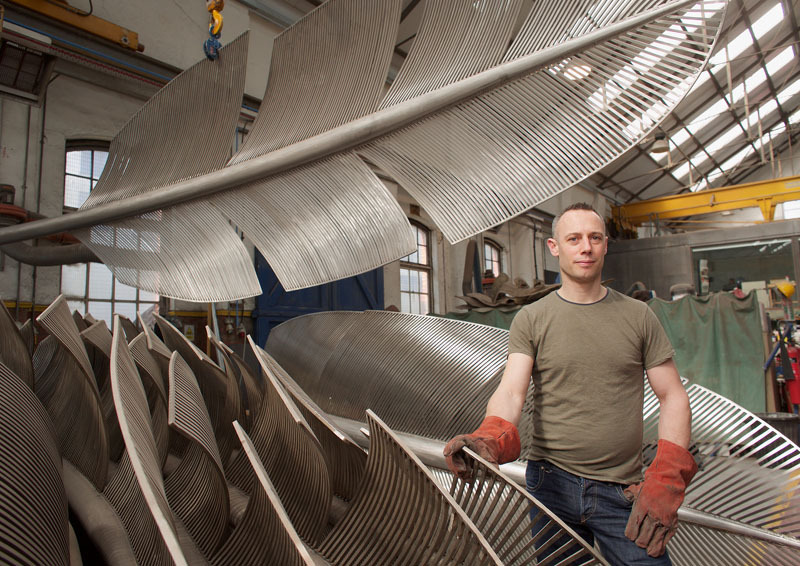 Alex Pentek, Studio image at the National Sculpture Factory, Cork, Ireland. Image Cathal Noonan. Work in the studio ready for shipping to Australia… The work traveled in 2 shipping containers from Cork, Rotterdam, across the Atlantic through the panama canal, then across the pacific passing the Fiji Islands to Brisbane Australia. The work is now in storage until the final location is decided. Big thanks to Arup Cork, London and Brisbane offices who made this project possible! An Urban Oasis will soon sprout from the ground in the centre of the Gold Coast’s bustling tourist precinct. 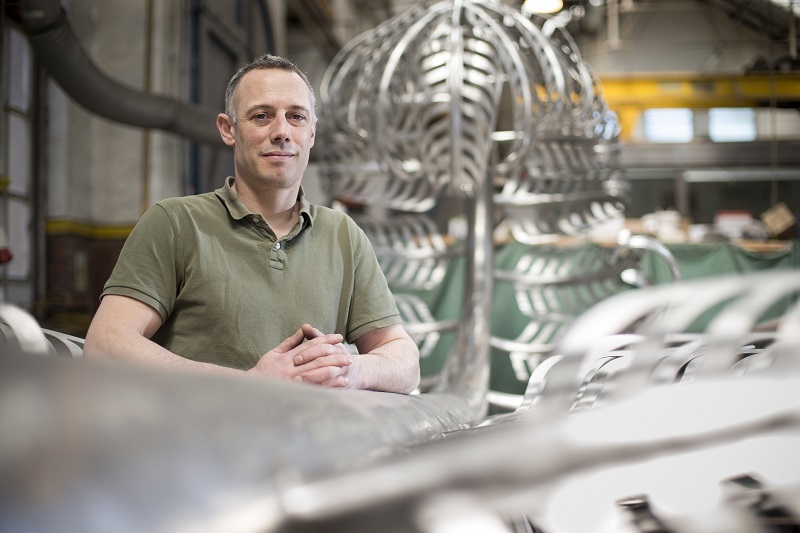 The winning design for this major public art commission was created by international artist Alex Pentek. 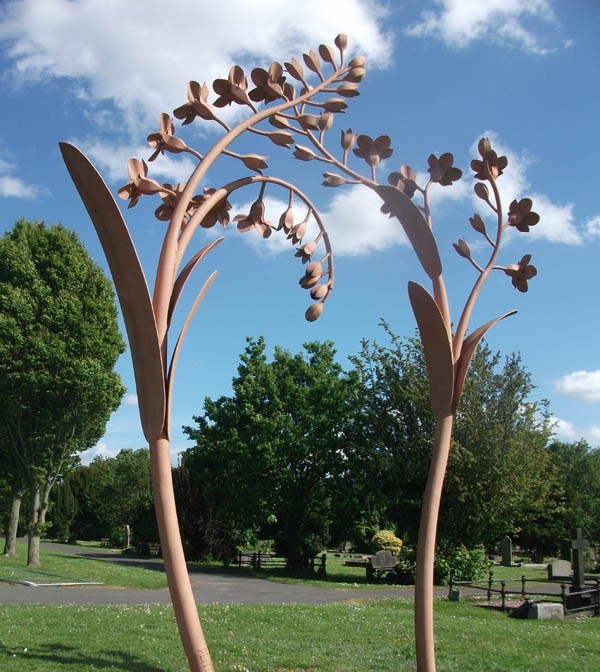 Titled Urban Oasis, it comprises four stainless steel ferns, standing eleven metres tall and complemented by a series of ground panels.The artwork is an impression of the shield fern which once grew in abundance at this location. 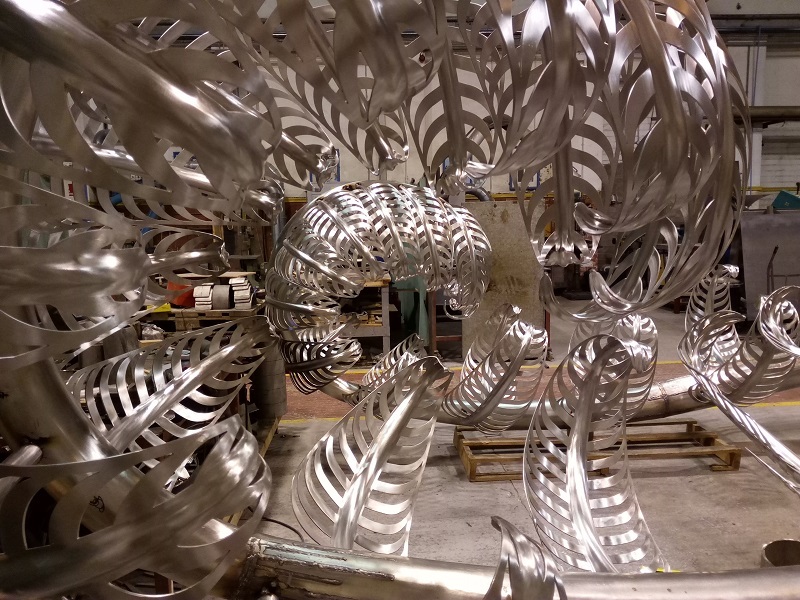 The structures will curl, stretch and appear in various stages of growth as they emerge from the concrete at each corner of the intersection of Surfers Paradise Boulevard and Elkhorn Avenue.This significant public art project, to be installed by April 2017, marks the pivot point between our vibrant nightlife in Surfers Paradise and our city’s cultural heart – the cultural precinct in Evandale.An independent jury selected the winning design from five final entries the jury’s recommendation was endorsed by Council at its meeting on 24 June 2016.“This idea was inspired by the area’s recent history of as one of the most diverse sub‐tropical littoral rainforests in Australia, (which in some cases even grew back after it was cleared). It has been my aim to capture the imagination of the public visiting this urban oasis by depicting the contrastingly delicate impression of Shield Ferns that once grew in abundance here. Showing different stages of growth, their monumental scale together with a series of ground panels symbolise the importance of this heritage and our place within a broader natural order”. Watch the video and delve into the artwork. Kindred Spirits. 2015. Hand tooled finished stainless steel. H 6m. (Work in progress & views of recently completed commission for Midleton, County Cork, Ireland). 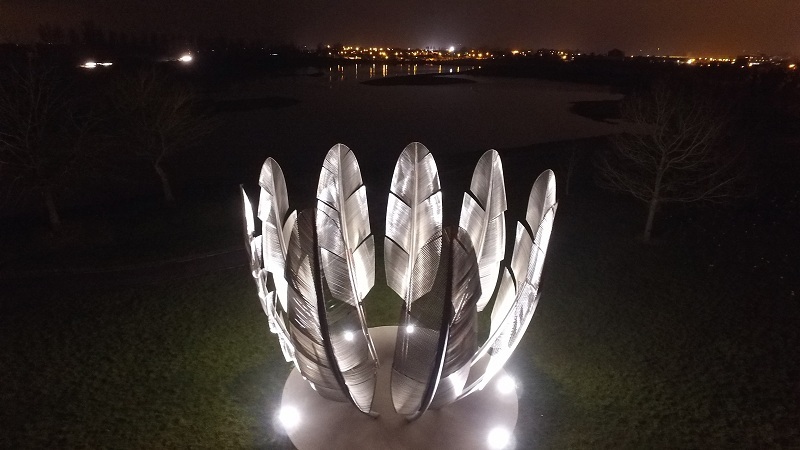 A short video about the project was created by The Choctaw Nation of Oklahoma during their visit to Ireland in 2017, when Chief Garry Batton and members of his council and tribe received official recognition at the official launch where over 1,000 people attended. (The works shown being made in the video are actually ferns for Urban Oasis, Australia). Kindred Spirits in the making… (Image Neil Danton). 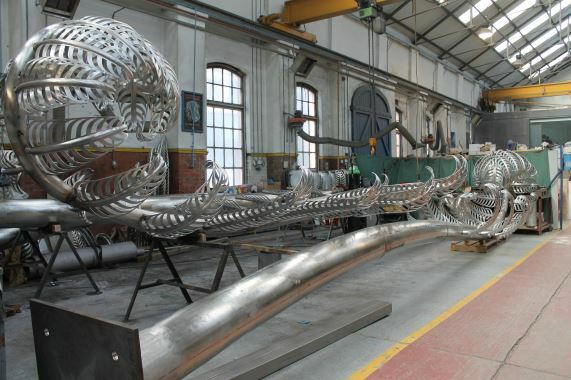 With six welds for each vein, it took over 20,000 welds to complete the entire work. 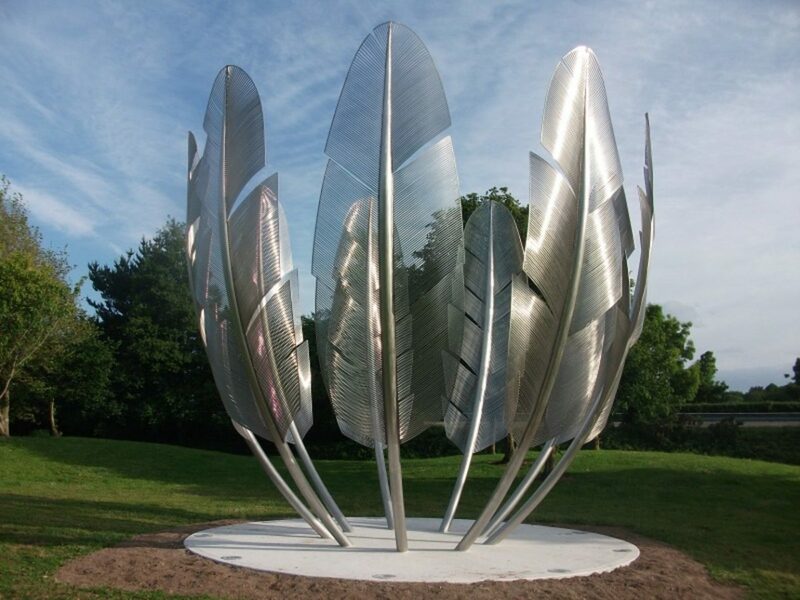 This idea was recently selected for Midleton, County Cork, Ireland, and is my response to the history of the Choctaw Nation’s help to Ireland during the famine in 1847, when they sent $170 to help to feed the Irish starving men women and children. It was only 16 years earlier when the Choctaw were forced from their native land by the American government in what is now known as the trail of tears, making this act of kindness even more significant. By creating an empty bowl symbolic of the Great Irish Famine formed from the seemingly fragile and rounded shaped eagle feathers used in Choctaw ceremonial dress, it is my aim to communicate the tenderness and warmth of the Choctaw Nation who provided food to the hungry when they themselves were still recovering from their own tragic recent past. 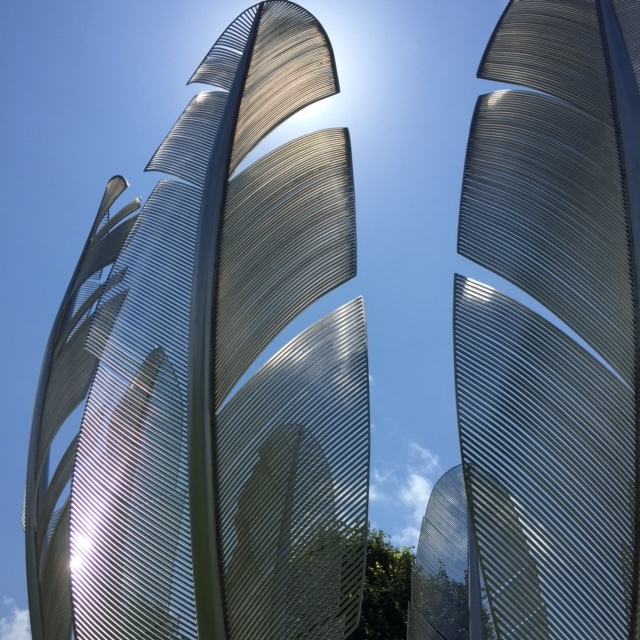 I have also chosen feathers to reflect the local bird life along the nearby water’s edge with a fusion of ideas that aims to visually communicate this act of humanity and mercy, and also the notion that the Choctaw and Irish Nations are forever more kindred spirits. Forget Me Not. Belfast City Cemetery Decorative Artwork Commission. Building Peace Through the Arts: Re-Imaging Communities Project. 2015. 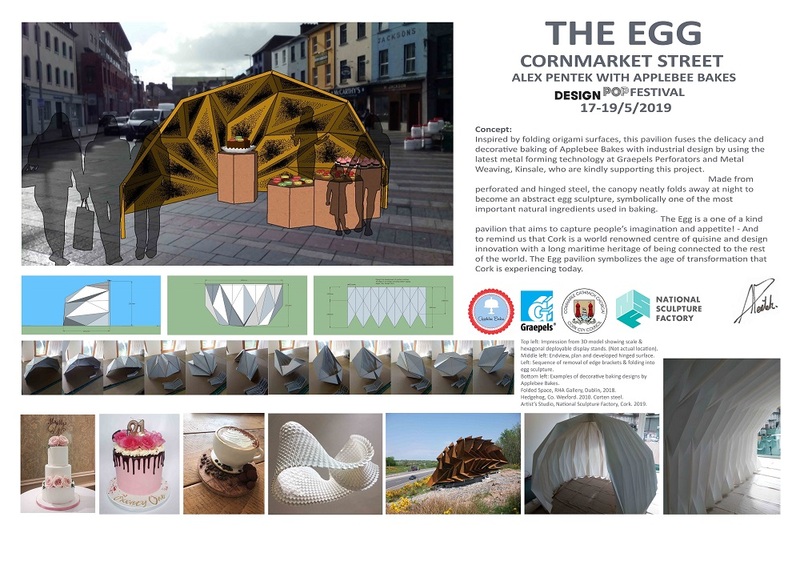 This site specific idea grew from the themes of ‘Life’ and ‘Time’, as chosen by local groups and stakeholders from a public consultation process. When I visited the cemetery I was moved by the poignancy of the location and it struck me that the forget-me-not flower, a very often overlooked plant, might be the perfect symbol for the surrounding unmarked plots; Both moving through time yet frozen in time. The graceful form of these forget-me-not flowers captures the fragility of life as they reach towards the light and begin to open. 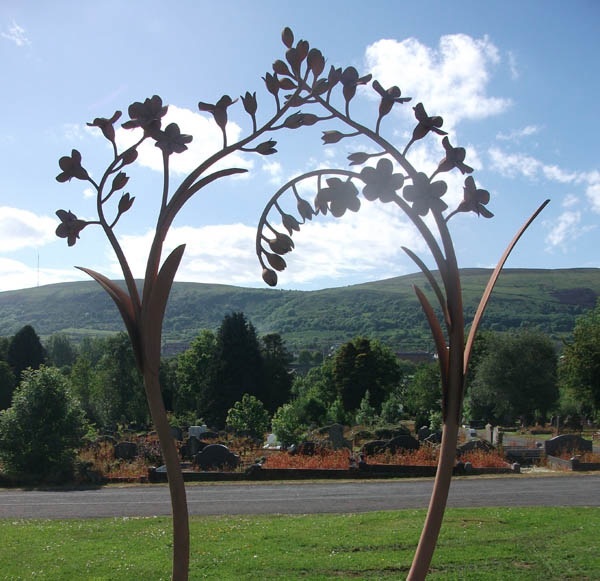 Also traditionally symbolizing remembrance, true love and memories these two flowers, fabricated from bronze coated stainless steel will form an archway and entrance to the surrounding ‘poor ground’ plots, where many young children and infants are also buried. (Originally shown in the baby public plot, this location was changed to another more inclusive and central poor ground plot within the cemetery). I am interested in the relevance of the interplay between the real-life scale of these tiny flowers and the visual impact of seeing them represented in heroic scale in the sculpture. 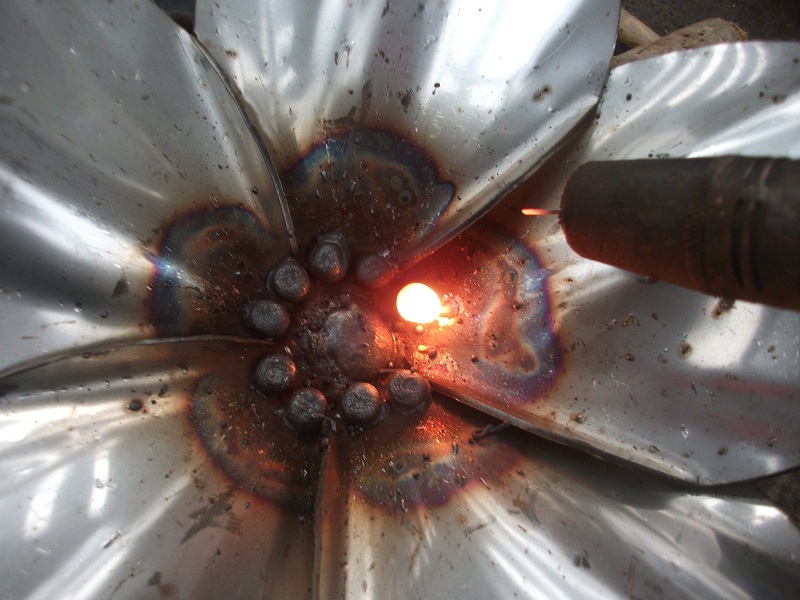 Not greatly valued as a flower, the notion of making them in precious metals has implication for how we now consider the status or value of the surrounding ‘poor ground’ areas.